I recently signed up for Social Security and had to dig out my DD214, the military service record that summed up my two years in uniform. Reading through the form, I was reminded that I’d actually earned the Good Conduct Medal. No big deal, really, it just meant that I’d toed the line and curbed my rebellious streak. But I got to thinking about what “good conduct” really means. At a time when civility seems to be a lost personality trait I’m frequently reminded that good conduct is simply a matter of being considerate of others. The Aviators’ Model Code of Conduct (secureav.com), developed by Michael Baum, recommends voluntary practices for pilots to advance flight safety, airmanship and the general aviation community. There are “sample recommended practices” that do provide some guidance, and they provide valuable suggestions, but they’re aimed more at risk management than ways for pilots to demonstrate good conduct in day to day operations. Talking to John about his effort to “convert” from an aviation klutz to a responsible aviation citizen provided some real-world suggestions about how we can demonstrate good manners. 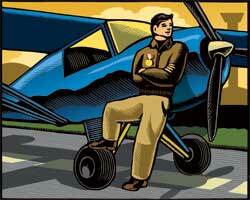 But, John argued, making the move from aviation klutz to citizen is a very simple way for a pilot to greatly increase his enjoyment of flying and, at the same time, markedly reduce his risk of having an accident. Another impediment to good citizenship is that it’s not normally included in the training we get when we’re learning to fly. “In fact,” John argued, “occasionally we’ve even been trained to do something that has an unnecessarily negative impact on others.” For example, he said, instead of being trained to fly quietly on approach, we’re often told to increase propeller rpm on a constant-speed prop early in the approach to be ready for a go-around. Fortunately, it turns out there are a few little things we can do that will make a big difference. For instance, climbing at best angle-of-climb speed right after takeoff not only multiplies our alternatives in the event of an engine failure, but it geometrically reduces our noise impact on the neighborhood as we gain altitude. Another way to reduce neighborhood noise is by keeping your pattern tight and delaying your descent in the pattern until you’re on a normal descent path to the runway. “A lot of pilots start their descent abeam the landing point regardless of how extended the traffic pattern has become, and they wind up flying an extended pattern at low altitude over neighborhood homes,” he said. According to John, if the pattern becomes extended simply hold your altitude, slow down, keep the airplane you’re following in sight and turn base when it passes abeam of you on final. This keeps your noise footprint closer to the airport and has the safety advantage of making it easier for everybody to keep traffic in the pattern in sight.